9 Comments on Where Did the Nail Get Put? Good for her! 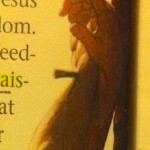 It seems like I remember a Watchtower study from years ago where they make the case that, in Jesus day the wrists were considered part of the hands or some such thing. More than one nail in the hands, interesting. I really don’t understand why the Society makes such a big deal about this issue. Does it matter the form that the stauros took? Whether it be in the form of a cross or just a stake he still paid the ransom, right? The fact of the matter is the Romans sometimes used crosses and sometimes upright poles to torture and execute criminals. As for the cross being an idol would it make it less wrong that instead of a cross, people idolized an upright stake? Of course not. And as for being a pagan symbol, did Jesus choose the shape of his torture stake? No the romans did. To me whether Jesus died on a cross or a torture stake is a non issue for me. After doing quite a bit of research I tend to lean toward a cross. I dont think it really is that big of a deal one way or the other. To be dogmatic and argumentative about it as the WT has only seems to divide. The important thing is that Christ died for us. In a way I see that both viewpoints are correct. From my research I feel that Jesus most likly carried a small beam (patibulum) on his shoulders to the execution site. Then this small beam was attached transversly to a larger vertical “starous”. The hands were nailed to the small beam and the feet to the large one, the sighn placed above the head and the whole works raised upright. In this way you have a small timber that a man could carry rather than a huge cross or post which very unlikly could have been carried. Also you have as the main of the execution devise a large upright post or “starous”. This also harmonizes with John 20:25 which speaks distinctly in referance to the hands. I don’t think it really matters either..what I do think matters is that we shouldn’t use the torture device that our Lord Jesus was killed on as an object of adornment or veneration. To me that is important. I’ve done a little bit of research over the years on this topic and have come to the conclusion that a singular upright stake was not the most logical implement to impale someone on. A more common practice was to combine a transverse beam with an upright beam or stake which in effect created a T. This way Roman soldiers could easily lift the victim up and onto the upright beam. This would allow the entire implement of death to be only a few feet off the ground. Either way, the cross or torture stake is very significant in our Christianity, as highlighted by the Apostle Paul: “Never may it occur that I should boast, except in the torture stake of our Lord Jesus Christ, through whom the world has been impaled to me and I to the world.” (Galatians 6:14), “For there are many, I used to mention them often but now I mention them also with weeping, who are walking as the enemies of the torture stake of the Christ” (Philippians 3:18), “..and that he might fully reconcile both peoples in one body to God through the torture stake, because he had killed off the enmity by means of himself.” (Ephesians 2:16). Now boasting in the cross/torture stake is obviously not the same as worshiping the cross or creating idols, as we know God’s view on this. But to downplay it because of how others misuse it is also wrong. In the TV series ‘Jesus of Nazareth’ they portrayed a kind of ‘scaffolding’ system that consisted of upright poles joined together. 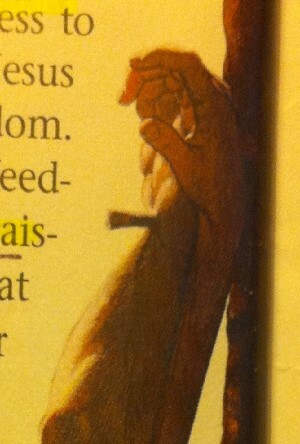 Jesus himself had a short beam across his shoulders that he carried. Once he arrived at the execution site they lay him on the ground and drove the nails into his hands then with ropes pulled the beam over the scaffolding and then nailed his feet to the pole.It took literally seconds to accomplish. Once he was dead they took the beam down and left the scaffolding there ready for their next victim. I imagine a lot of research had gone into this scene and it made a lot of sense to me.